As most our listeners know, Laura is a huge fan of eggs. (or is a recovering huge fan of eggs) She has spent the majority of her short vegan life looking for anything and everything that will remind her of eating her formerly favorite food. First things first. A scramble. When I first realized that I wanted to stop eating eggs for ethical reasons (Paul McCartney’s video Glass Walls is what did it in case you’re curious. Followed swiftly by reading Eating Animals insured I was done with my beloved runny yolks) I was incredibly saddened by the sudden loss of literally all of my favorite breakfasts. At this point I didn’t realize how amazing an eggless waffle could be or how flavorful a tofu scramble can be! I don’t exactly know how I stumbled upon it but I found this video on youtube and immediately tried it out. I don’t know who this chick is but I love this video. It’s really a step by step tofu scramble instructional for beginners which for me, was exactly what I needed. Her technique is a little different than some others I’ve tried and honestly I like hers a lot. The first few scrambles I made I followed her directions diligently and I absolutely loved the way it came out. This video is also the first I’d ever heard about nutritional yeast so it basically completely changed my life. As time marched on, I discovered a few other tofu scramble recipes, and I find that for my palate, most of them use too many spices. Occasionally I’ve noticed that a scramble with too many spices can actually become a little gritty to the bite. I loved eggs so you can imagine how upsetting the idea of grit in my “this is supposed to remind you of scrambled eggs” is for me. My other favorite scramble technique comes from Sarah Kramer‘s iphone app, Go Vegan with Sarah Kramer. I believe the recipe is originally from one of her cookbooks, but I don’t know which one. The unique aspect of her approach, which I LOVE, is that she mixes all the spices and the tofu in a bowl before it hits the skillet. BRILLIANT. This cuts down on cooking time, and for me, also cuts down on how much oil or water I end up needing to add. You also don’t have to watch it as carefully which frees you up to make pancakes at the same time. 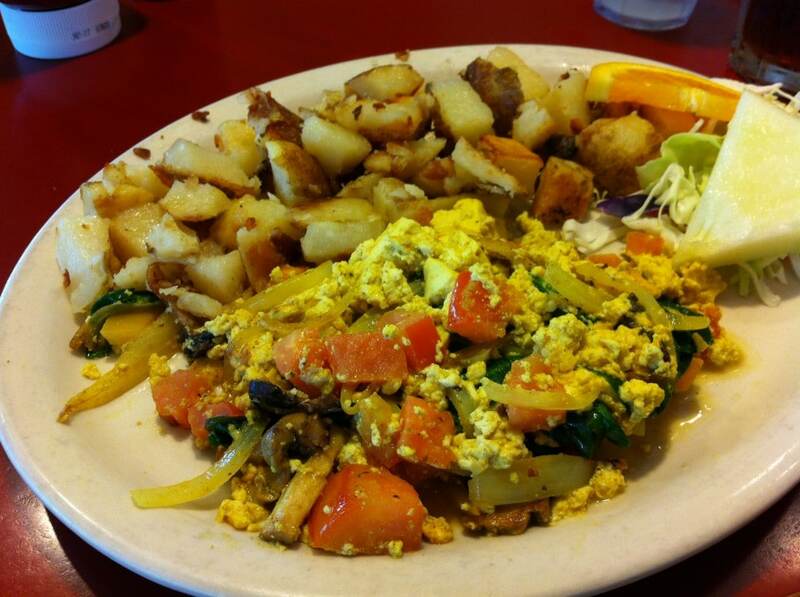 Bottom line, tofu scrambles are the best! And just like eggs, you can be as picky as you want about them and try as many different techniques as you like. If you’re ever in the bay area, be sure to try Hobee’s tofu scramble! It’s definitely my favorite restaurant tofu scramble I’ve tried which is beyond awesome since they’re about as omnivorous as a restaurant gets. Way to go Hobee’s! Have a great Monday Mofoers! yeah! I love tofu scrambles too. The video is Julie Hasson – she is amazing and she has TONS of awesome videos. She’s also the author of Vegan Diner which is a totally great cookbook. http://www.juliehasson.com/ 🙂 Happy MoFo! Thanks for the info! We love you Julie Hasson! You’d best! Julie makes my world go round an round. She and her husband have many many more videos available online from everyday dish. Pretty nice post. I simply stumbled upon your weblog and wished to mention that I’ve really loved surfing around your blog posts. In any case I will be subscribing for your feed and I am hoping you write again soon! Oh my, yes! That is the lovely Julie Hasson and all of her videos are so much fun to watch. I agree about the eggs, I was always a fan of a hearty, non-sweet breakfast and tofu scrambles are the best for that. By the way, I just want to say what a big fan of your podcast I’ve become! It is one of the most entertaining out there, and I particularly love your theme song!